Who was the best tap dancer? Fred Astaire or Gene Kelly? 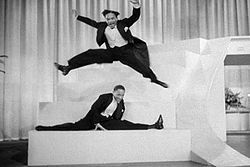 I along with many others would say it is Fayard and Harold Nicholas or as they were better known the Nicholas Brothers.